Marriage: Capt Duncan R WATSON  in Apr 1937 in Falkland Is. She became a nurse, and went off to the Falkland Islands, and became a matron in the King Edward Hospital in Stanley. Mary was devoted to her work. She had a great love of people, and became a greatly respected person on the island. She died on 14 April 1958 when she was only 53. Her obituary reads, "She had her own quiet faith in God, and in the principles and teachings of Jesus Christ. For Mary Watson, faith was something to carry around the district, in the same way as her small black bag, the symbol of her professional calling. Her faith was practical, warm, sensible, and respected by those she tended, as well as by many others. Jesus referred to this service to others in the highest possible terms - as you serve others, so you serve Him. Now in the Cathedral, on the South wall stands a plaque, to which people who appreciated Mary Watson contributed. It stands as a witness to an important fact, that Mary Watson's life of Christian service for others was a living sermon". 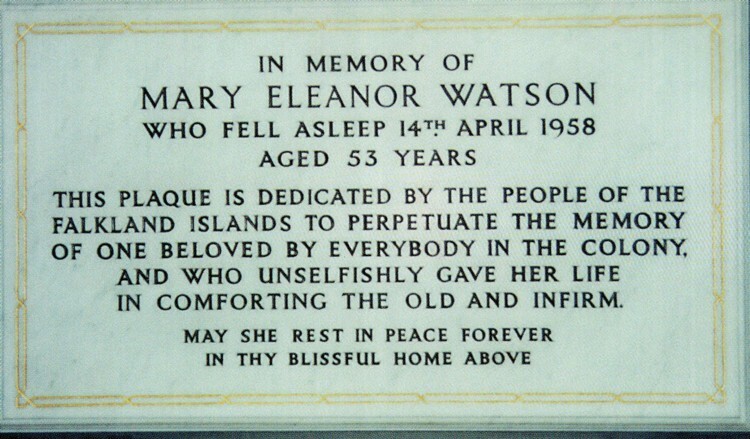 The plaque in Christ Church Cathedral, Stanley, reads "In memory of Mary Eleanor Watson who fell asleep 14th April 1958 aged 53 years. This plaque is dedicated by the people of the Faulkland Islands to perpetuate the memory of one beloved by everyone in the colony, and who unselfishly gave her life in comforting the old and infirm. May she rest in peace forever in thy blissful home above". A stained glass window on the Nth wall, depicting Mary as District Nurse on her bicycle, and St Raphael, was also dedicated with the words "A.M.D.G. Mary Eleanor Watson born 7th September 1904 died 11th April 1958. In abiding memory"
A hill on the island, called Mary Hill, was named after her. Mary had no children, but she and Duncan adopted Marie Heather Valerie who was born in 1941. Marie's mother died in childbirth, she was Mary's best friend.